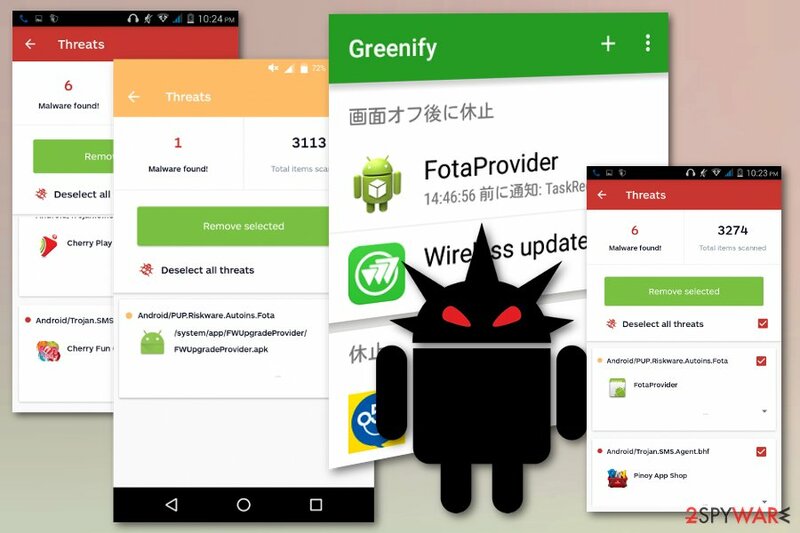 Fotaprovider virus is the version of Android operating systems targeting malware. Fotaprovider virus is dangerous Android application that could affect the general performance of your device by working in the background and collecting specific information about the user. The virus is one of the Android virus variants that has been spreading worldwide from China preinstalled on the devices made by this country manufacturers. The term “Fotaprovider” has been used by the McAfee, Avast, Malwarebytes and other anti-viruses which report it as an average threat. However, some experts have notified that the virus can also find suspicious apps used to track users and send the collected data back to their country of origin. These viruses include Android applications like Pinoy App Shop, E Warranty, Cherry Play, Cherry Fun Club and other programs that have already become a problem. However, Fotaprovider virus can also have different functionality, based on different type detection results that various users report in online forums. Fotaprovider virus has been creating frustration for users worldwide because it has been constantly appearing on the screen as a threat detected by AV engines, e.g. McAfee, Avast, Malwarebytes. Unfortunately, it seems that these detections are not false positives and can be related to the following apps: Gibbo, Pinoy App Shop, E Warranty, Cherry Play, Cherry Fun Club and many more. Keeping these apps on the system can lead you to the loss of specific information, including your personal data. You should note that when your AV tool shows Fotaprovider virus as a dangerous application and offers removal procedures, you need to take needed measures to get rid of the intruder as soon as possible. If this virus starts running in the background and using resources of your phone, it can lead you to the data loss and also significantly affect the performance of the device. For the Fotaprovider virus removal, you should first disable the app related to this detection. Additionally, root the device and get rid of the malicious app. Finally, employ a reputable anti-malware application from the App Store and double check your Android device. We can recommend Reimage for this procedure but feel free to use the program based on your criteria. If you can't remove Fotaprovider virus (unfortunately, such cases are quite common) look for professional help or find the seller of your device. Since all those related applications are preinstalled by the manufacturer, you should return your device and try to get your money back. Fotaprovider virus is the virus that can act as harmless adware but it also has trojan functionalities. The issue with pre-installed malware and spyware apps on Chinese devices has been known for a while now. However, people still tend to put themselves at the risk of getting their products online because their price is very reasonable when compared to other manufacturers. At first, the device may look and work properly but, after a while, various issues can be uncovered. Tons of different models, including Star N9500, numerous Alps models, ITOUCH or SESONN, have been found having pre-installed programs on their systems. They can not only be set to affect the speed of the phone or its performance but can also decrease the security of the mobile device. Developers gain profit from secret purchases and advertising or try to get more financial gain from the spyware installed by malware programs. Due to the disguise, infections are rarely discovered, and can runs in the background without being detected. In most cases, these malicious programs are planted into legitimate applications what helps them preventing the removal. Various add-ons and apps run regularly on the device, and the user cannot notice anything suspicious besides the decreased speed of the device and several malfunctions. You can avoid this if you choose reputable sources like the official physical phone or online store, program developers' website, providers. This way, you can prevent additional installations and pre-installed programs. Additionally, install reliable security software and let it check your system. Locate your Android device Settings and locate Apps. Find the bad app and choose to force stop/disable. You can then reboot the device and uninstall applications reported as possibly related to the malicious Fotaprovider. You can also install other ROM instead of the infected one, but this step is for more advanced IT users. Try to return the device where you purchased. Additionally, to completely remove Fotaprovider virus, you should make sure that all possible threats get deleted from the system. If one or two related applications get left on the phone, the whole virus termination procedure is not successful. Get the tool like Reimage, Malwarebytes MalwarebytesCombo Cleaner or Plumbytes Anti-MalwareMalwarebytes Malwarebytes and scan the system thoroughly. This way you can see all possible threats and remove them. Locate the power button. Press and hold it for a few seconds until the menu is shown. Choose Power off option. The dialog window suggests you reboot the device in Safe Mode. Choose this and press OK.
You can also try another method of entering this mode. Turn your phone off and turn it on again when it starts to reboot again, press and hold Menu or both Volume buttons constantly to see the Safe Mode option. If this method is not working to enter the Safe Mode and remove Fotaprovider virus, you can search the proper Safe Mode instructions for your phone. You can also do that with the factory reset option if you cannot find this option in Settings. ^ Steve Dent. Report finds Android malware pre-installed on hundreds of phones. Endgadget. Technology news and reviews. ^ My Android has been infected with FotaProvider and I can't remove it. Reddit. Online community. This entry was posted on 2019-02-18 at 07:04 and is filed under Malware, Viruses. You can quickly scan the QR code with your mobile device and have Fotaprovider virus manual removal instructions right in your pocket. How did you remove Fotaprovider virus?